In high harmonic spectroscopy, an intense laser field removes an electron from an atom, and then forces the electron to recombine. The emitted spectrum is a measure of the transition probability from a bound orbital. 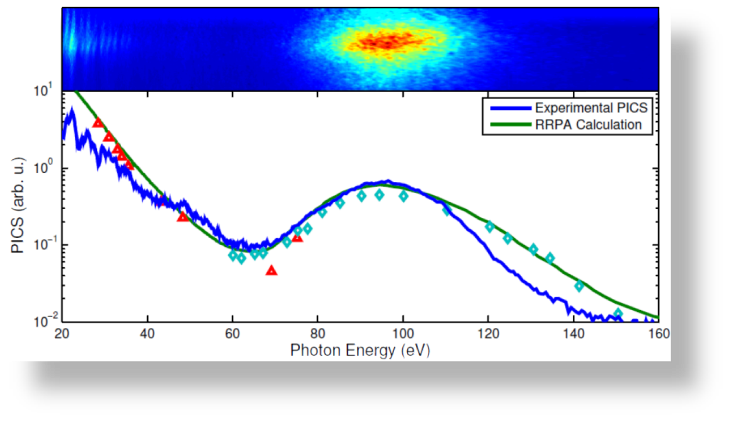 Surprisingly, in xenon we found the signature of the giant resonance at 100 eV, that had only been seen in synchrotron photoionization experiments. This implicates the deeply bound 4d state of xenon, that cannot be affected by the intense laser. We believe that there is collisional excitation from the 4d to the 5p levels of xenon.